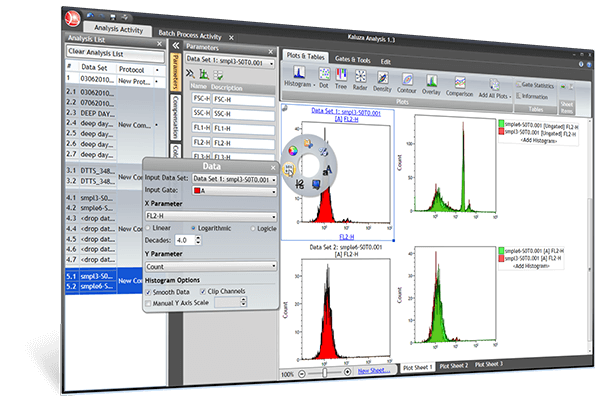 Kaluza Analysis Software is a stand-alone program supporting data analysis from any Flow Cytometry Standard (FCS)-compliant file, regardless of the manufacturer. This is a full-featured high-performance package with improved processing capabilities for multidimensional analysis including enhanced color compensation algorithms and real time adjustments to data display allowing visual data exploration. The software can process files of up to 20 million events while offering analytical speed that is dramatically faster than other commercially-available software. The built in batch processing function improves the laboratory workflow for high throughput laboratories. Value pricing available for bundle of 5 concurrent seats, controled by the Network License Control Center, for the current released version at the time of purchase in perpetuity.